The muse will come when you stop messing around on Facebook or goofing off on Twitter. Reading other people’s stuff sometimes inspires the muse, but the muse can be prickly, even jealous. Ignore your own creativity? The muse runs away. The muse doesn’t like when you spend too long working for other people and not long enough on your own. If you don’t care about your creativity, the muse won’t either. 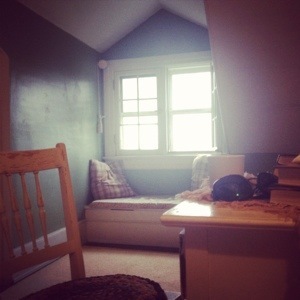 This is where I am writing, — in a room with a window seat, looking out on Lake Champlain. The muse likes a room with a view. The muse will show up when you let go of perfectionism. When you stop comparing yourself to all of the successful, rich people you get bombarded with every single day. Those beautiful people get to your muse. Those people are like vampires, making you run into your house and lock your front door. The muse doesn’t like when you choose safety over the midnight walk in the woods. The muse loves to roam too and wants you to live on the edge of a cliff, not in the cocoon. The muse will show up when you put fingers on the keyboard and wipe away the blank screen. The muse will show up when you stop cleaning the kitchen. When the muse shows up, it’s not work. It’s play. You just have to get out of your own way. Something, some brilliance — seriously! – will flow through you. You will sit back when you are done and go, “Wow! I did that!” But no, you didn’t do that. Not alone any way. You were the conduit. The creative spirit, the muse, flew through you and is now flying away because your ego — such a barking dog — chased it away. And tried to take all the credit. But that’s okay; that’s the ego’s job. The muse will be back tomorrow. Or later. But won’t/can’t stay forever, because you have to eat and go to the bathroom and chat with your kids and make dinner and throw a load of laundry in the washer and gossip about the neighbors and, don’t forget, you’ve got to pay the bills. I know, as an artist and writer, I can visit the muse when I jot my ideas and images in a little notebook, even when I am away from my keyboard or canvas. I use Field Notes, a product. But I get no money (or respect) from Coudal Partners for this endorsement. Although occasionally, I swipe pack of Field Notes when I am at the Coudal household. I want to write more about my prickly, beautiful, sensitive, strong muse. But I have to go for a walk. I have to stretch my body. I have to take my time. I have to let my muse fly. This post was inspired by the Steven Pressfield’s The War of Art, a book that made me to take my muse seriously. Is Your Writing Muse in a Snit? More inspiration and good sense. Thanks. More good sense and inspiration. Thanks!